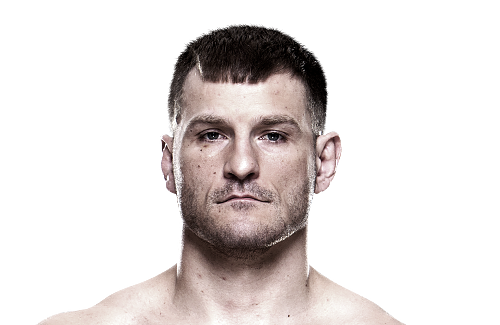 Stipe Miocic...NCAA Division I wrestler? Discussion in 'UFC Discussion' started by PSX, May 28, 2014. I didn't know Stipe was actually a Div I wrestler in college (according to his Wiki page). How come he doesn't use his wrestling all that much? I've only seen him stand and box. He tried for a very pathetic single leg takedown on an exhausted Roy Nelson and still didn't get it. That's why this was a surprise to me. Division 1 wrestler does not necessarily mean he was a standout. He wasn't committing to takedowns, he was making Roy work by defending and thus gassing further. Wasn't he a GG champ too? That's why he boxes. he must've been that guy w/ all the school spirit. He is confident in his boxing. Maybe he's just sticking with what works for him, not every wrasslers skills on the mat translate to MMA well. He beat Shane Del Rosario with takedowns but he had good standup and not good takedown defense. He reminds me of a HW Chuck. I think he's going to improve and be a serious guy in a couple years. The Moloko man, Fight Professor, BabyBlue_Bomber and 3 others like this. I thought the same thing about JDS...Look how that turned out. JDS is a better fighter than Chuck ever was. He became champion and lost to the best heavyweight fighter since Fedor? I don't see your point. It was actually a compliment towards Stipe lol. Chuck's grappling (counter wrestling and major scramble ability) in MMA has so far been more impressive than anything JDS has done. Spookv and Typrune Goatley like this. Nobody has been able to take down and control JDS, Rampage and Couture did that to Chuck. JDS struggled with Cain in the clinch but Cain's clinch is beyond anything Chuck ever had to deal with and also the reason Cain's clinch was so effective was because his striking on the way in, he is a better boxer with a better jab and head movement than JDS. His superior boxing skills allowed him to evade JDS' power on the way in while also hurting or landing shots to put JDS on the defensive so he could easily tie him up if he wanted to. grihenrumet and Kung Fu bb like this. ...did you see the second fight? Cain took down and kept JDS down for long periods of time. And Couture is the originator of Cain's style, your selling him quite short here. And it's not Chuck's fault JDS has only gone up against one good MMA wrestler. Uh, no. He was never able to keep JDS down for very long. Not even in the third fight either. Kung Fu bb likes this.